The Kansas City Chiefs are reportedly placing the franchise tag on edge defender Dee Ford, keeping their sixth-year edge player from reaching unrestricted free agency for the first time in his career. While Kansas City’s defense was one of the league’s worst units in 2018 (finishing the regular season 28th in EPA allowed per play), Ford had the best season of his career; he led all edge players in total pressures with 84, and he finished eighth in pass-rush productivity (8.5). Unlike previous seasons, Ford showed the ability to rush from both his preferred left side (9.4 PRP) and the right side (7.1), which allowed the Chiefs’ other edge player, Justin Houston, to move around the defense as well. The move to use the franchise tag on Ford is a sound one for a Chiefs franchise that has been digging their way out of some salary cap issues since the beginning of former GM John Dorsey’s tenure with the team. Tagging Ford would result in a one-year commitment to the tune of about $17 million next year, lower than the $20 million per year a top edge player would likely command in a multi-year deal. 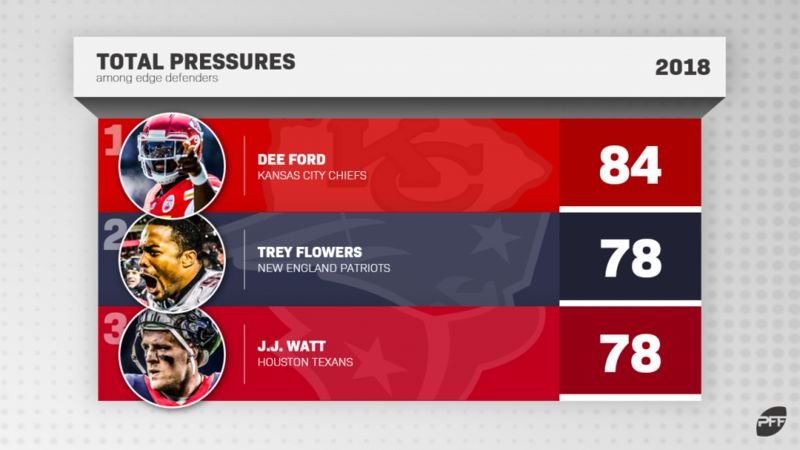 It also represents approximately what the Chiefs would get back should they release Houston, who has had an amazing career that has produced over 400 career pressures on just 2,800 pass-rush snaps, but his age (30), his injury history (21 missed games the last four seasons), and the team’s recent draft picks of Breeland Speaks and Tanoh Kpassagnon make him expendable. Tagging Ford also makes sense because it allows them to pull back more of the curtain on a player whose career has likely created more uncertainty than it has alleviated. Drafted in the first round out of Auburn, Ford sat behind stalwarts in Houston and the perennially underrated Tamba Hali (over 650 career pressures), before getting a chance in 2016. He emerged in 2016 with 12 sacks, but his more-predictive pressure numbers (35 hurries and 54 total pressures) and poor play in run defense led to an overall PFF grade (63.5) that still left folks wanting more. An injury in 2017 kept him to just 316 snaps, before a 2018 season that was both productive and deserving of a great PFF grade (87.7). Additionally, the Chiefs are transitioning from Bob Sutton’s 3-4 defense to Steve Spagnuolo’s 4-3 defense. While these differences are mostly overblown in a nickel- and dime-heavy NFL, the added layer of uncertainty is something that is likely going to keep the Chiefs from using the majority of their $25 million (before the Houston move) on a long-term commitment for a player who (a.) is not as good as interior defender Chris Jones (91.0 overall grade) and (b.) plays for a defense that is several good players away from returning the team to the defensive heights that they achieved in 2013 and 2014. There are rumors that the Chiefs are shopping Houston, and are open to the idea of trading Ford as well. The tag allows Kansas City to dangle a high-reward asset to other teams without a huge contract attached, and for a team that’s looking at starting cornerback Steven Nelson facing free agency, star safety Eric Berry playing just four games the last two seasons and a linebacking corps that saw free-agent signee Anthony Hitchens earn one of the worst grades of any defensive player in the league last season, the prospect of being able to rebuild their defense more from scratch could be appealing to a team for which an average defense would lead to being a favorite to represent the AFC in the Super Bowl, given the strength of their offense led by Andy Reid and Patrick Mahomes. The Chiefs don’t face an ideal situation, either defensively or from the perspective of the salary cap. However, tagging Dee Ford is likely the right choice given their current circumstances with all three outcomes (Ford is traded, Ford is brilliant, Ford is less than brilliant) palatable for what should be one of the league’s best teams for years to come.